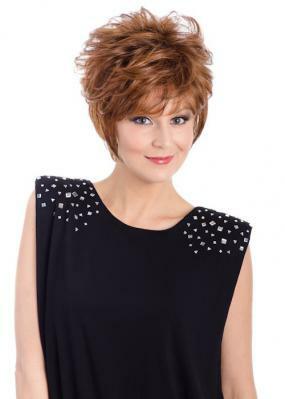 CORA is fabulously fun flair with feathered layers that will frame your whole face with full airy bangs and a wispy layered nape. The natural allover wisps make this style very versatile. You can finger it from the crown downwards or wear it flipped up. With Tony of Beverly's exclusive Ambient fiber, the styling options are only limited by your imagination. Ambient™ 100% Synthetic Fiber - Heat resistant fiber that can withstand heat up to 350F utilizing a blend of Kanekalon™ Futura™ and other fibers. Ability to achieve different looks using flat-iron, curling iron, blow dryer. The style stays locked in place until heat-styled again. HarpCap™- Combining the durability of a full cap and the lightweight wearability of a capless. The wefting is attached to a smaller contoured lace material at the crown to allow durability, light weight and ventilation.